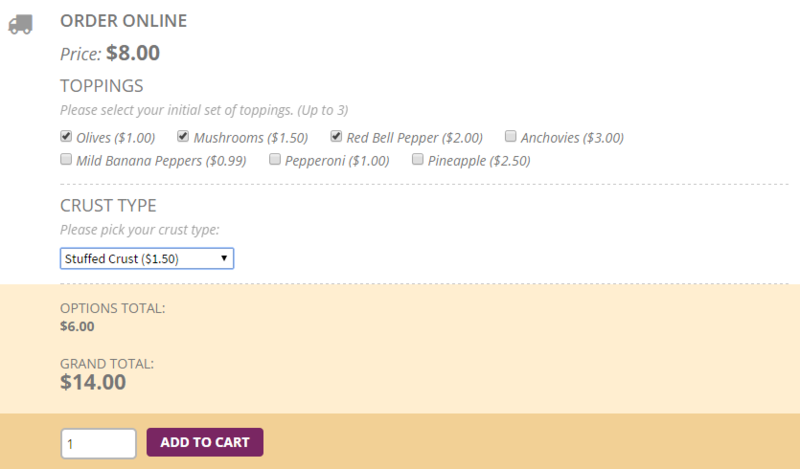 By popular demand, the brand new “Toppings” or better known as Product Add-ons Extension by WooCommerce is now compatible with the Foodpress Online Ordering addon. Not only will you have the ability to give your customers the option to add check boxes for toppings for Standard products, but the functionality extends to the variable products as well. Seen here, you can get a quick glimpse of the brand new Online Ordering Addon feature showcasing the new features of toppings, and also a selection of a Pizza Crust Type as well. Check out the Foodpress Online Ordering addon here and please remember, this integration requires the purchase of WooCommerce Product Add-ons extension to be compatible and function as intended.